Image credit: Boston University and NASA. (PhysOrg.com) -- Detecting exoplanets that orbit at large distances from their star remains a challenge for planet hunters. Now, scientists at the University of Leicester have shown that emissions from the radio aurora of planets like Jupiter should be detectable by radio telescopes such as LOFAR, which will be completed later this year. Dr Jonathan Nichols will present results at the RAS National Astronomy Meeting in Llandudno, Wales, on Monday 18th April. "This is the first study to predict the radio emissions by exoplanetary systems similar to those we find at Jupiter or Saturn. 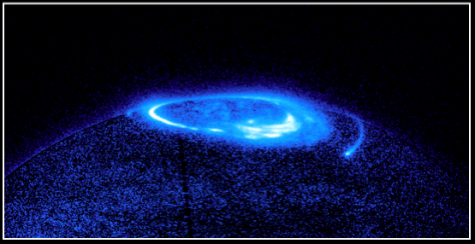 At both planets, we see radio waves associated with auroras generated by interactions with ionised gas escaping from the volcanic moons, Io and Enceladus. 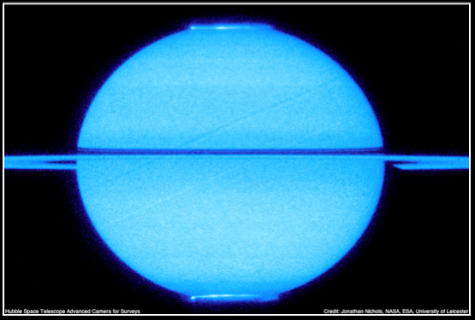 Our study shows that we could detect emissions from radio auroras from Jupiter-like systems orbiting at distances as far out as Pluto," said Nichols. Of the hundreds of exoplanets that have been detected to date, less than 10% orbit at distances where we find the outer planets in our own Solar System. Most exoplanets have been found by the transit method, which detects a dimming in light as a planet moves in front of a star, or by looking for a wobble as a star is tugged by the gravity of an orbiting planet. With both these techniques, it is easiest to detect planets close in to the star and moving very quickly. "Jupiter and Saturn take 12 and 30 years respectively to orbit the Sun, so you would have to be incredibly lucky or look for a very long time to spot them by a transit or a wobble," said Dr Nichols. Image credit: University of Leicester, NASA, ESA, Jonathan Nichols. Dr Nichols examined how the radio emissions for Jupiter-like exoplanets would be affected by the rotation rate of the planet, the rate of plasma outflow from a moon, the orbital distance of the planet and the ultraviolet (UV) brightness of the parent star. He found that, in many scenarios, exoplanets orbiting UV-bright stars between 1 and 50 Astronomical Units (AU) would generate enough radio power to be detectable from Earth. For the brightest stars and fastest spinning planets, the emissions would be detectable from systems 150 light years away from Earth. "In our Solar System, we have a stable system with outer gas giants and inner terrestrial planets, like Earth, where life has been able to evolve. Being able to detect Jupiter-like planets may help us find planetary systems like our own, with other planets that are capable of supporting life," said Dr Nichols. However, planets that orbit at large distances from their star are probably not going to receive enough radiant energy from the star to sustain life. @omatumr This is about detecting planets not extra terrestrial life. This is a very good idea. If you can detect gas giants in stable orbits at similar distances to their star as in the Sol system, then these systems could be examined by other (now standard) means for smaller, rocky planets closer to the star's Goldilocks zone. The idea seems so simple and obvious, it's a wonder it hasn't been proposed before! They should build an instrument capable of doing a whole sky survey. I still think we shouldn't ignore the possibility of smaller, rocky satellites of close-orbiting gas giants. No reason at all why such worlds couldn't have life on them (even in our own solar system, we currently have vague suspicions regarding Europa, Ganymede, and Titan.) And there really isn't any good reason why a gas giant satellite can't be as large as Earth, Mars, or Venus, or even larger. I still think we shouldn't ignore the possibility of smaller, rocky satellites of close-orbiting gas giants. No reason at all why such worlds couldn't have life on them... And there really isn't any good reason why a gas giant satellite can't be as large as Earth, Mars, or Venus, or even larger. I wouldn't rule out the possibility, but I think that might prove to be a challenging environment (if we're interested in finding habitable worlds). There would be significant tidal effects on such a world and it might even be tidally locked. Then it would have to contend with a high radiation environment and it might be regularly bombarded with meteorites that are attracted by the gas giant. Also the gas giant would tend to swamp the signal from a terrestrial moon, making it even harder to detect. So, while I wouldn't rule out such a configuration, I still think a single orbiting rocky planet would be a much better bet. There would be significant tidal effects on such a world and it might even be tidally locked. True. However, the same tidal effects would keep it warm and geologically active -- the latter being a prerequisite for life, IMHO. Plus, even a tidally locked gas giant satellite still exposes all sides of itself to the star. Though this may make its "day" longer than that on Earth, still it's not necessarily a deal-breaker. That's true. However, closer to the star there may be fewer meteorites (particularly if the solar system is a mature one.) But still, that's probably the biggest danger. Yet, if there are other gas giants in the solar system, farther away form the star, then they might vacuum up any meteorites before they get closer in. "For the brightest stars and fastest spinning planets, the emissions would be detectable from systems 150 light years away from Earth"
That's probably not going to mean too many planets are found this way but it makes sense that there would be other ways to find Jupiter like planets, after all they're almost Suns in their own right. I assume that estimate was based on currently available detectors. Once the square kilometer array gets built, that range could be pushed out significantly (if the ska can be used for this purpose). Even laying out potential sites for further examination by Kepler would be highly significant, and being the case that certain orbits are beyond Kepler's POV capability, any increase in that arena could well be the difference in finding the 'perfect' planet. Just to find more suns that have planets at all more than proves the worth of this effort.